Power to weight ration Bugatti and Ducati could only dream about. A 4 wheel drive monster that goes 0-100 in less than 5 seconds and will cost you tens of thousands less than the new Ferrari 458. This isn’t the newest super car to come over from Europe or Japan, or one of those monsters that Hennessey Performance has created. 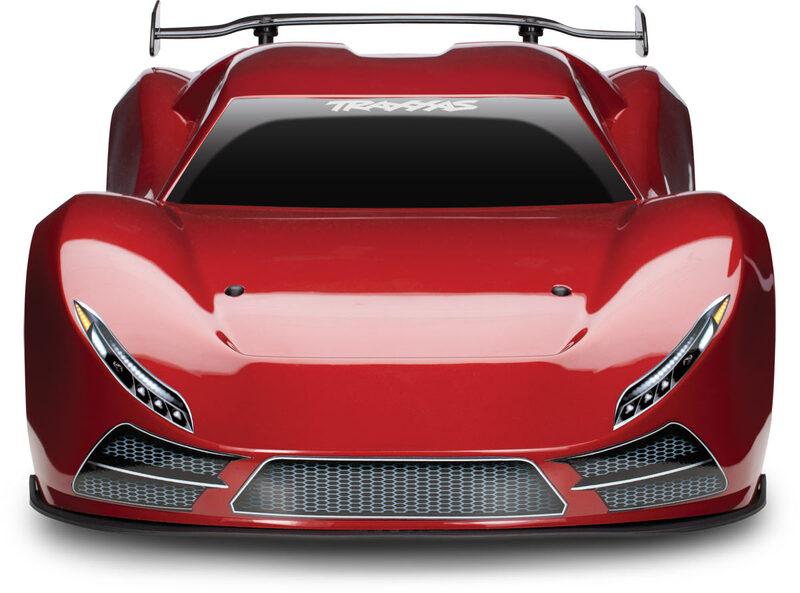 This is the Traxxas XO-1. It’s also capable of being driven James Bond style with your iPhone or iTouch. What is it, it’s the newest radio control car that is taking the world by storm. Measuring just 27 inches from read bumper to front and 11.61 inches across, this isn’t your 90’s RC any more. They’ve gone to the gym and used some steroids. Powered by a Traxxas Big Block Brushless (1650 Kv) by Castle this is the fastest RC’s out. It doesn’t stop there, as there is a long list of after market parts you can buy, including new suspension for it. As of now the site has them as sold out, with a link to be notified when they are available for sale. If you connect your iPhone to the remote, the fun even gets better. Race-proven in the 8-time National Champion Revo, XO-1’s differentials represent the state of the art in power handling and efficiency. Precision silicone gaskets and X-ring seals allow the diffs to be tuned for specific running conditions by varying the viscosity of the fluid inside them. Reinforcing bars within the differentials increase strength to withstand XO-1’s over-the-top power. Differential access for tuning is quick and easy. Just remove the front or rear cover and the entire differential slides right out. Developed with advanced modeling techniques, XO-1’s stunning form has been shaped by pure function. The front splitter and canards, smooth undertray, rear diffuser and wing work in harmony to harness airflow and convert it to downforce while minimizing drag—critical to achieving 100+mph speeds. XO-1 is the first to deploy a fully developed and functional air-management system in a high-performance radio-control car. XO-1’s advanced aerodynamic components are integrated into a unique body developed specifically for high-speed stability and increased downforce, with a powerful, wide-track look. The body is molded in durable 1mm polycarbonate and features a metallic finish available in four colors. The durable, injection-molded rear wing is mounted solidly to transfer downforce to the body and chassis. Developed specifically for XO-1, the new SS (steel spline) dual-CV driveshafts are stunning examples of high-strength, low-mass construction and Traxxas’ attention to detail. The splined, nickel-plated shafts slide smoothly as the suspension is compressed, assuring efficient power transfer. The female half-shafts are machined and hardened steel with a durable black-oxide finish. The telescoping shafts handle much greater torque loads than conventional driveshafts. Flexible rubber boots protect the CV joints and splines from dirt and debris. Proven tough by the Brushless Edition E-Maxx, E-Revo, and Summit, Traxxas’ splined 17mm aluminum hex hubs are standard equipment on the XO-1 to make certain its considerable horsepower is transmitted directly to the road. The splined design is extra strong with unsurpassed torque handling to resist twist-out no matter how hard you launch the XO-1 off the line. ‘Pitch’ refers to a gear’s tooth size—the smaller the number, the bigger the tooth. Electric cars typically use 48 pitch gears; 32 pitch is common for nitro. XO-1’s gear teeth are the largest in the Traxxas line: Module 1, the equivalent of 25.4 pitch. In addition to having larger, more durable teeth, XO-1’s gears are a full 8mm wide to spread drive loads over a greater area to extend wear and increase efficiency. 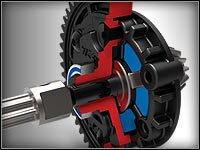 Even the pinion is specialized, made of high-strength steel and developed specifically for the XO-1. Developed specifically for the XO-1, the patent pending Cush Drive™ absorbs drivetrain shocks with a custom-shaped elastomer damper housed between the spur gear and the drive hub. Under extreme load (such as hard, high-traction acceleration), the elastomer flexes to dissipate shock without interrupting power flow. 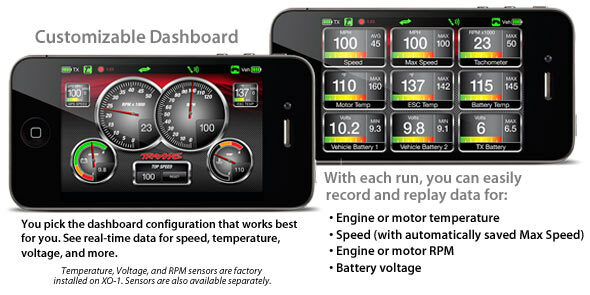 The result is instant acceleration with no wasted power. State of the art in every way, XO-1’s hard-anodized, Teflon®-coated aluminum GTR shocks represent the pinnacle of performance, offering silky smooth damping and a serious factory-works look. Thanks to the extra tough hard-anodized finish, shock performance stays true and consistent for less maintenance and better handling, run after run. Titanium Nitride coated shock shafts slide past X-ring seals for virtually friction-free operation, incredibly responsive suspension action, and extra-long seal life. The durable titanium nitride finish offers durable, smooth, consistent performance. Specially developed for high-speed use, XO-1’s slick tires are the first to be rated for 100+mph. Zero-stretch belting reinforces the soft-compound rubber, and molded inserts support the tread. Black-chrome Split-Spoke wheels set off the 17mm blue-anodized nuts that secure them, and the wheels extra-wide tire mounting area assures 100mph reliability. XO-1 can accommodate a variety of battery configurations and sizes with its unique, scalable battery compartments and quick-release hold-downs. The compartments’ rear bulkhead can be positioned for 135mm and 155mm pack lengths. The hold-downs can be flipped to hold 23mm and 25mm pack heights. With the optional expansion clips, 38mm to 43mm tall packs can be installed. Removing and installing batteries is easy; just flex the latch open to release the pack, and snap the hold down into the latch to lock it into place. For maximum strength and enhanced motor cooling, XO-1 features a new machined-aluminum motor-mounting system. The 8mm thick aluminum resists flex and holds the motor tight under the highest loads. XO-1’s high rpm and torque make proper gear mesh critical, so Traxxas engineers incorporated a unique adjustment screw into the mount to dial in the gear mesh with micro-precision. XO-1 is factory equipped with machined aluminum shock towers to provide stiffness and strength fox maximum control. The rigid shock towers make sure the XO-1’s GTR shocks work efficiently to absorb road imperfections and cornering loads. Vivid blue anodizing highlights the towers against XO-1’s dark-anodized chassis and black parts. XO-1’s artfully machined aluminum C-hubs are Traxxas Tough and feature carefully engineered steering and suspension geometry for track-ready performance. The brilliant-blue anodized finish, machined highlights, and the laser-etched TRX logos show off Traxxas’ signature style. New Traxxas aluminum stub axle carriers add larger 6x12mm bearings to handle the high-rpm demand of a 100+mph supercar while maintaining the beautiful blue-anodized look of the machined axle carrier. “100+mph, right out of the box.” That was the goal for XO-1, and Traxxas delivers with everything you need to hit triple digits—including a pair of Power Cell 3S LiPo batteries. Built with custom Traxxas cells and engineered specifically for the high power demands of Traxxas vehicles, Power Cell LiPo packs are fully equipped with oversized discharge tabs, Traxxas High Current connectors, Maxx Cable 12-gauge wire, and standard JST/XH balance plugs for long cycle life, maximum run time, and track-shredding punch. 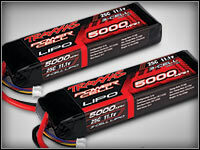 Click here to learn more about Traxxas Power Cell LiPo batteries, the only LiPo packs certified to give you the punch and on-demand power to reach the top speeds your Traxxas model is built to achieve. The XO-1’s brushless system comes equipped with two Traxxas High-Current Connectors. Designed to handle high-current applications, Traxxas Connectors effortlessly funnel the dual battery’s total power to the electronics keeping things running cool and at full capacity. 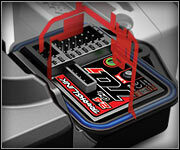 For more info about the Traxxas High-Current Connector click here. XO-1’s receiver is fully enclosed for protection from the elements. The antenna and servo wires route neatly through a special watertight seal, and a custom blue O-ring seals the receiver box to protect the receiver from water. The receiver can be removed for service and aftermarket receivers can be installed without losing the sealing properties of the box. Patent pending. XO-1’s steering bellcranks feature optimized geometry and a cam-type servo-saver to protect the servo’s gears from crash damage without compromising steering precision. Factory fitted, heavy-duty steel turnbuckles allow camber and toe tuning. The XO-1 is completely adjustable right out of the box to fine tune handling agility and high-speed performance. Captured rod ends provide unmatched durability and they simply won’t pop off.